'Buster' began his career as a trainee with Exeter City and showed such huge potential that he moved to Manchester City for £500,000 after less than 18 months in the first team. Alan Ball, his manager at City, famously predicted that Phillips would become the first £10 million pound footballer. However, the Exeter-born winger was unable to break into the first team at Maine Road and after loans spells with Scunthorpe United and back at Exeter, was sold to Portsmouth. Again he could not establish himself in the first team and after a loan period with Bristol Rovers, joined Argyle. 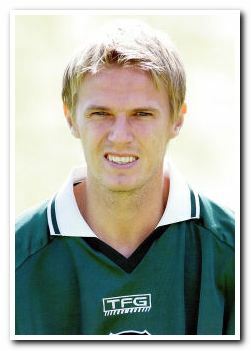 Phillips played a major role in the Division Three title winning season and made over 130 appearances, primarily on the wing, for Argyle during his four seasons at Home Park. Injury problems limited his chances in the 2003-04 League One Championship winning side and he was released at the end of the season, moving to Torquay United to complete a full set of Devon professional clubs. After two productive seasons at Plainmoor he was severely hampered by chronic fatigue syndrome which forced him to call it a day. After retiring, Phillips coached at Argyle’s Centre of Excellence and Exeter City’s Football in the Community scheme before joining The FA Skills Programme in 2010.